Ever since I joined Daring Cooks and Daring Bakers, I have been able to only participate a couple of times. It’s typical isn’t it? You think forever about whether you can commit and then decide, it’ll be ok, you can do it and then BAM! One thing after another and you can’t. Some months it has been family commitments, or my health issues or challenges that themselves pose a challenge (particularly challenges heavy on pork or alcohol that we do not consume). This month, however, I was hell bent on making sure I would participate in at least one challenge even though I have so much going on right now. I think what made it so easy was researching the challenge and finding some cheeses that are so easy to make. I have made cheese before but I wanted to try something a little harder, but not so hard that it would take up a lot of time that I don’t have. I also wanted a cheese I like to eat and use in my recipes. Sawsan from Chef in Disguise was our March 2013 Daring Cooks’ hostess! 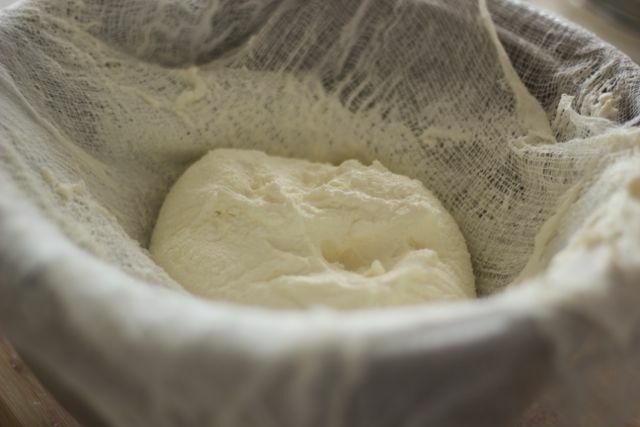 Sawsan challenges us to make our own homemade cheeses! She gave us a variety of choices to make, all of them easily accomplished and delicious! Sawsan’s research pointed me in the direction of another friend and fellow blogger, John from the blog from the Bartolini Kitchens. I have recently discovered John’s website and I just love all his family recipes, tips and ideas, not to mention he’s a pretty cool guy. 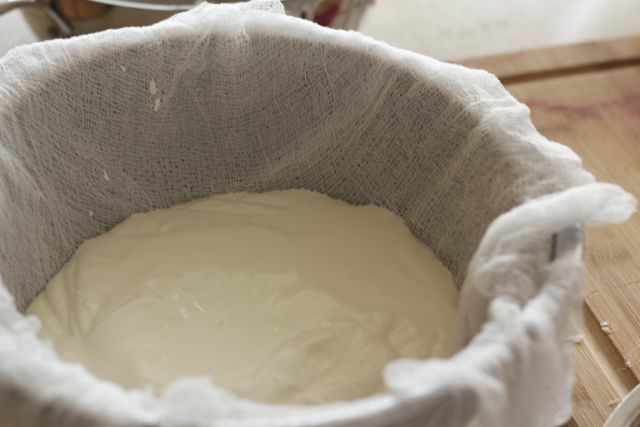 He did a whole series on cheese making and there, I found his recipe for mascarpone. I didn’t realise how easy this cheese was to make and I could make it in one day without having to rush out and buy stuff. I absolutely love mascarpone; in tiramisu (my favourite way to devour mascarpone), in pastas, by itself and so on. It is so expensive to buy in the shops and when I found out I could make the stuff at home, it was like this revelation (imagine clouds parting and sun rays beaming down). Every Friday, our milkman delivers fresh milk from the dairy and so I added a pint of heavy cream and a pint of half and half on my order slip. My order for milk and cream was waiting for me when I opened up the cooler on my front porch (the dairy supplies a little cooler we place by our front door for the milkman to pop in our milk bottles) on Friday morning. The same day I started making the mascarpone. By Saturday, it was draining and almost ready to be eaten. I sneaked a taste, oh so good and so unbelievably easy! Why didn’t I find John’s blog earlier??? I wasted so much money buying tiny tubs at the shops! Now you know how easy it is to make your own cheese, check out John’s blog for more cheese making techniques and also because it has some great recipes. 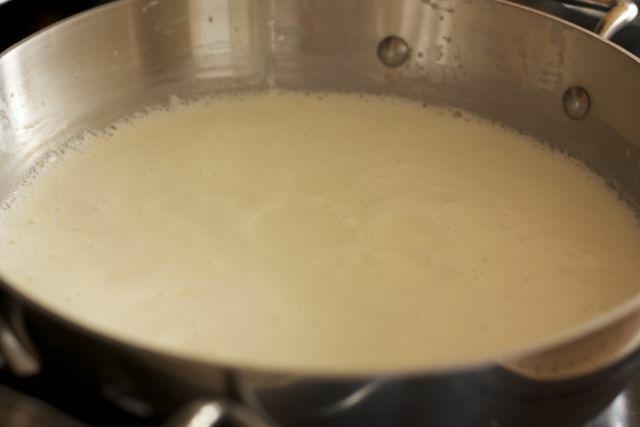 Place the cream and half-and-half into a clean, sterile pot with a lid and heat over low to med-low heat until it reaches 185˚. 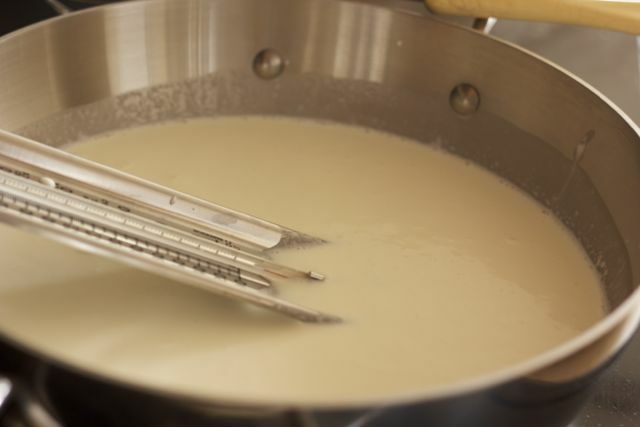 Stir frequently to prevent cream from scorching on the pot’s bottom. A double-boiler works fine, too. Cover and maintain 185˚ temperature for 5 minutes, stirring occasionally. Mixture should show signs of thickening. 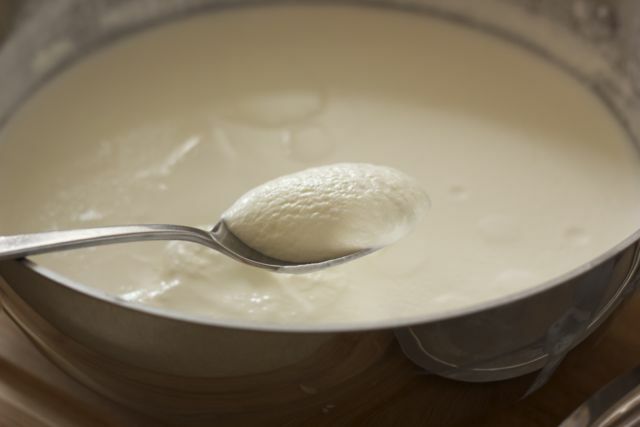 The next morning, the mixture should have thickened more and you should see traces of the whey beginning to separate from the curds. 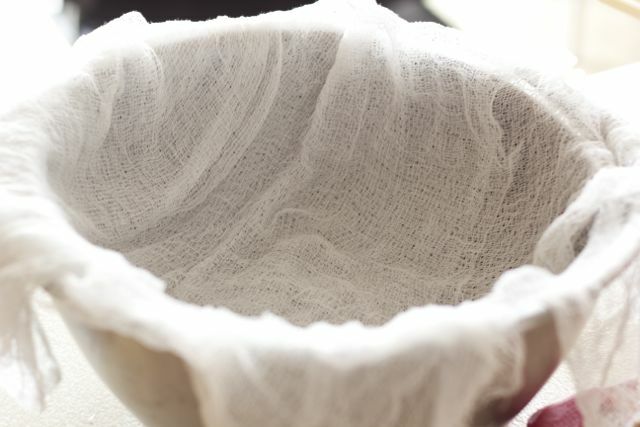 Grab the handkerchief’s 4 corners, tie them, and use them to hang like a sack over the sink or a large pot. If your kitchen is exceptionally warm or if it has drained a few hours and is still not to your liking, place everything into the fridge to drain. Since I couldn't say it any better than John, I just let him say it...word for word :). The photos are mine, however. The following day, as the snow continued, I turned on my oven to bake a roulade and used the mascarpone cheese as a filling inside. That post is coming up next so stay tuned! The homemade mascarpone was not only easy but absolutely delicious in the pasta dish I made for dinner Saturday night (first picture) and also, in the roulade the next day. My advice is to stop spending money buying mascarpone and start making some! You’ll be glad you mastered this cheese. A big thank you to John for his recipe and his help. Well done you! I love home made cheeses & the sense of satisfaction is unbeatable, isn’t it? What a fantastic step by step guide. I was bought a cheese making set last year for my birthday and still haven’t got round to making any! I need to join this Daring Cooks challenge next month. David Crichton recently posted..Sesame Crusted Miso Salmon with Soy Pearls. Thanks David. 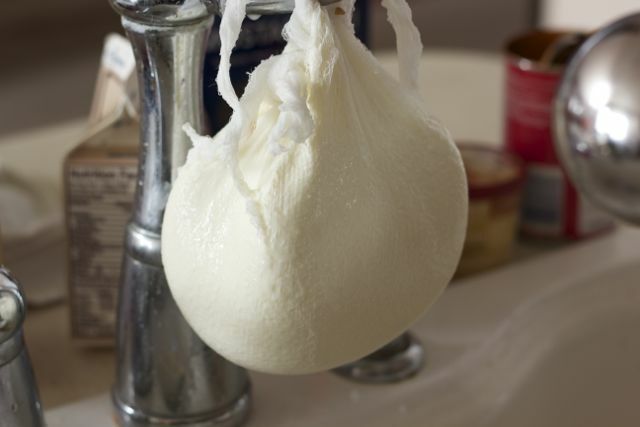 I am surprised you haven’t made an cheese yet, thought that would be right up your alley! I need to do this right away. Yours looks really good! Thanks Maureen, you should do it! It was so good and so easy! Obviously, without a doubt, I have to do this!! 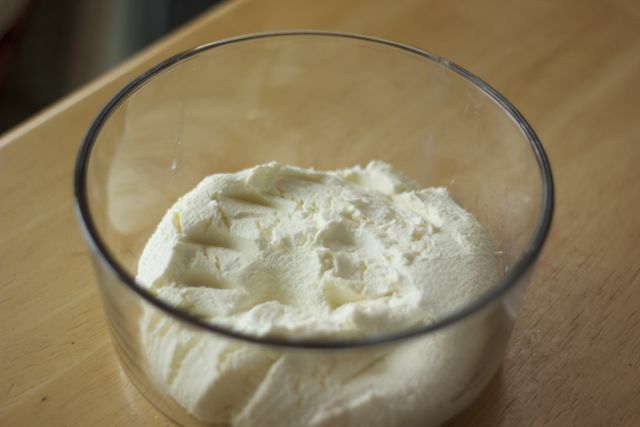 Your step by step photos are so lovely showing how to make the mascarpone! Love this, Nazneen! I usually buy an Italian imported mascarpone…and an 8 ounce container costs $6.50. This would definitely save me $$$. Have a great weekend! You know Carol? I was thinking about you while making this!You should definitely try it, so much cheaper. John’s recipes are the bomb! Easy to follow and taste so good. THis turned out really well. Wow, that’s brilliant. And your “Swiss roll” looks divine!! Thanks Jenny! Thank you for stopping by! I’m so glad you tried the recipe, Nazneen, and enjoyed the results. It certainly was an eye-opener for me when I tried it for the first time. And so inexpensive, too! Now, when I see the price of one of those tiny containers of mascarpone at the grocery, I cannot help but smile. And thank you for being so gracious in your comments towards me and my blog. That was very kind of you. Thank you John for your help and your recipe. It turned out so well and it was so easy to make. You should Uru, it’s really easy and way yummy! Never knew mascarpone could be made at home at are so east to make. Thanks for sharing. Thanks Lail! Yes, we are very lucky to have milkman still. The milk is amazing and the kids won’t drink store milk any more. Wow! I am so glad to find this idea. Thanks, Nazneen. Since time began people made everything themselves and that means everything! Butter, mayo, ketchup, mustard, mascarpone, the list goes on and on. I know that is all very obvious but I think people forget or maybe never thought about it. I like to know that, if I wanted to, I could make anything I wanted for myself and don’t have to always go to a store and BUY it. It’s so easy once you make it, you won’t buy it ever again. I too made mascarpone for the first time this month and it was amazing! so easy and super creamy! Thanks Sawsan! Thank you for the cheese challenge too!